2k PU Plastic Repair Semi Rigid 50ml 1.5min Translucent. Polyurethance plastic repair is a thixotropic polyurethane adhesive for the structural bonding of a wide range of thermoplastic materials. 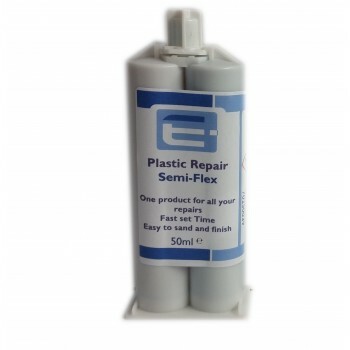 Ideal for body shop repairs such as bumpers, front grills, lights and indicators. It is easy to sand and finish, odourless and cures at room temperature in 60 seconds. Apply an excess to overfill the repair , allow to cure and then sand using coarse grit until almost flat, then fine grit to finish. Additional tips are available- 80250MXT mixer tips.